My inspiration for this project was Winter Thank You cards. January is when I send out all my Thank You cards for Christmas gifts. I also discovered some new blogs who are hosting challenges! This is the first time I'm entering one of my cards in an online challenge. -Addicted to Stamps Challenge Blog: MAKE YOUR MARK! Use anything you feel will make your mark on your project - Markers, pencils, chalks, paints, brushes, sponges, etc. 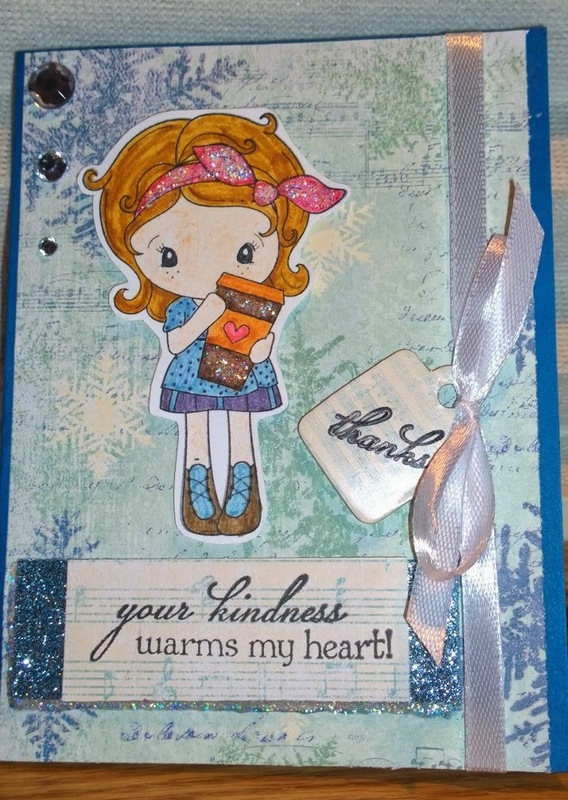 -Crafting from the Heart Challenge Blog: Entry #160 Anything goes! -Crafts Galore Encore Challenge: Entry #240 Anything goes! -Creative Craft Cottage: Entry #73 Anything goes! -Inky Chicks: Entry #79 Anything goes! -Paper Creator's Crafts: Entry #108 Anything goes! -Party Time Tuesday: Entry #202 Anything goes! -Through the Craft Room Door: Entry #122 Anything goes! -Wags 'n Whiskers: Entry #84 Anything goes! I adore the Kiki La Rue stamps from C.C. Designs and this is my first one I added to my stamp collection. Would love to get more in the future!